Ever since I organized my earrings last summer I wanted to get my necklaces in order. I had a hook organizer in my closet that was put there from the prior owner of the home. This hook system always fought with the earing organizer and the future outfits I had styled for the week. 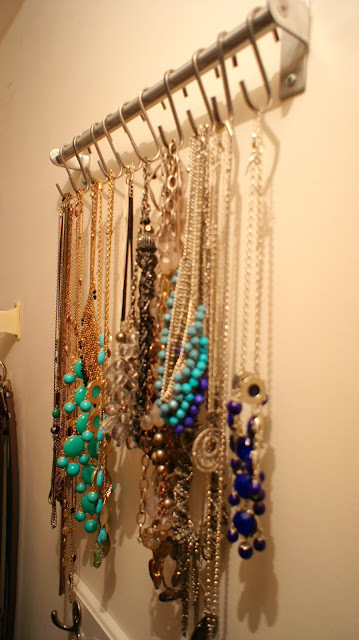 I never realized what necklaces I had because they were always covered up by clothes. I am the type of person that needs to always see what I have in order to put my clothes together. My next home will have a larger closet, but right now I work with what I have. 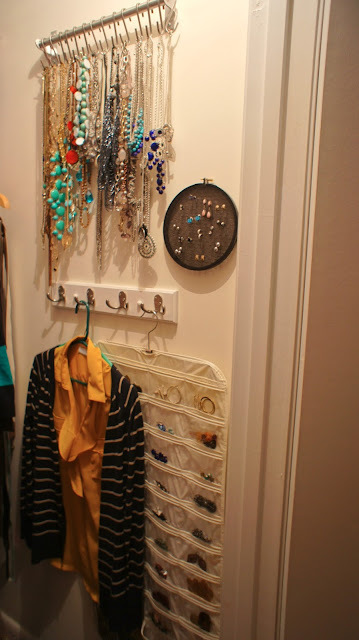 I have seen numerous necklace organizers, but they mainly were all display pieces that sat out on wardrobes or dressers. Being minimalists in our home, we try to minimize clutter wherever possible. I needed a system to organize and display in the current small space that we call our closet. I had seen these Grundtal rails in IKEA from one of my numerous visits. I had always thought of them for use in the kitchen because the market place in IKEA always used them to hang various kitchen tools. There are hooks that hang from them that allow these tools to hang. This is such a great system to put anywhere in your home. The Grundtal Rail $6.99- $9.99 depending on the size. The Grundtal Hooks cost $2.99 for a pack of 5. I bought the 15.75” version and three sets of hooks for a grand total of about $16. The benefit outweighed the cost, and that made me so happily organized. In order to put the new necklace organizer up I needed to move the current hook system down. First, I removed the current hook mount. The wall was a mess so I needed to clean it up. I wish I could totally put things in front of it the hole, but I couldn’t just act as if the holes from the molly screws didn’t exist. They aren't exactly small. I complained for a while, but got to work. I got out this sweet hole spackle and got to work. I love the fact that that stuff comes in Pepto Bismol pink and dries white. This color is such a good indicator for those people (i.e. me) that don’t know how to wait for it to dry before sanding! I did one coat, dried, sanded and then did another coat. The wall was seriously messed up and bubbled a bit, but I did my best with what I had. Little tip: We have a Wet/Dry Shop Vac (from Amazon) and it has become invaluable tool for many of our projects. Hold up the wet/dry Shop vac hose directly underneath the area when sanding and your mess will be minimal. After sanding, cover with matching paint and let it dry. My husband actually started the process of hanging the hook systems before I painted because he had to go out. I would have hung it crooked and this is why he helped me out. Once the paint was dry, I hung the rod, the hook system and was done. Note, this system is not located in the marketplace in the store. They are on display in the kitchen section there. They are near the cabinet and kitchen organization section. Don’t be fooled and waste your time. We did when we went there and I hate wasting time in IKEA or any other store. I really liked getting to go through all of my necklaces. I can’t say they are all quality pieces, but with my style randomness, who needs necklaces that will only be used for short styling periods. When organizing into gold, silver, bead, and random sections, I discovered a few necklaces that I hadn’t worn in many years. Those guys went right into the donate pile. I also hung up my DIY earring holder I made a few months ago. I used a small tack nail to hang it up and display my smaller stud earrings.